Echo Spot is an Amazon product designed to fit anywhere in your house and does most anything. Since it comes with the possibility of connecting it to Alexa, a smart voice-based service capable of technological wonders like controlling smart home devices, playing music and so on. The majority of people like to keep their Echo Spot close by, even at night. That’s when a small detail might become an issue. The Echo Spot’s display is appealing, modern and bright. No matter how much you dim this illumination, it can still be troubling, especially at night. Be it a man or a woman, to wake up to a shiny light slowly scorching your retinas is not a pleasure. That’s where Night Mode comes into play. This feature dims the screen to prevent the uncomfortable sensation, while also setting the background to black, to make the effect even less bothering for your eyes. You don’t have to be some tech wiz to enjoy this nice alternative display version that your smart device offers. Just follow these easy steps, and you’ll be back at enjoying the lush life in no time. Gently swipe down from the top of the screen and tap on the little gear icon. That will open up the Settings menu. Browse the settings, until you find the “Home & Clock” section. Don’t be afraid to give it a tap. Go to the bottom and choose the “Night Mode” option. Yes, you found it, but we’re not there yet. Next, tap on “Nighttime Clock” to toggle it, or simply said, enable it. You might want to quit now since the mystery has been debunked, but you’ll miss out if you don’t stick around for the last step. You can customize it a bit by tapping the “Scheduled” options. 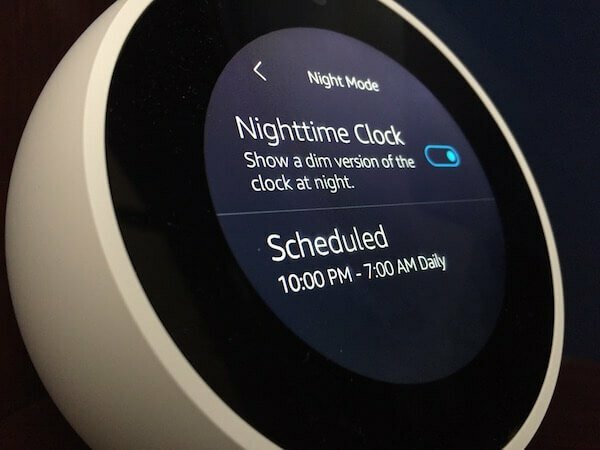 In this way the Night Mode will enable and disable at your set time, sparing you of the trouble of turning it on and off all the time. And there you go. Night Mode is enabled. Your sleepy future self will be content, his or hers eyeballs eased. Before you go on with your usual everyday activities, here are some other things that you might want to know. Even at the lowest light intensity, it is possible that for some, it will still be too bright. Some of us need a pitch black and quiet environment to be even able to fall asleep. Maybe Amazon will fix this feature somewhere in the future. Night Mode, however, permits you to still the time or whatever data you might be interested in, in the middle of the night, without blinding you. Also, the effectiveness of the Night Mode is also based on your own brightness levels. If you went all in, with the full 100 %, there is no way you’ll get the dimmest possible setting. Cut that brightness in half and the ending result will be a lot more acceptable. No more wonders about what the Night Mode is and how it works. And most of all, now you can enable it at any time, making your slumber hours significantly pleasing. Keep your eyes and your sleeping habits healthy with such a minimal effort.